This page is a supplement to the DNA For Beginners Classes, Spring 2019 at DCHS MN. This DNA Vocabulary List is a starting point. If you want to learn more about each term, please use Google for in depth information. 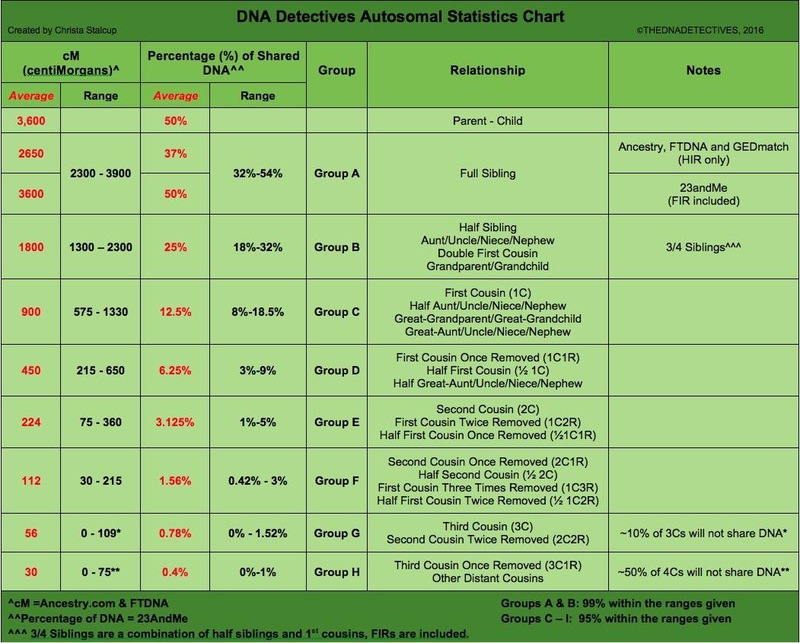 To understand how closely you are related to your DNA Matches, there are a couple of tools you can use. 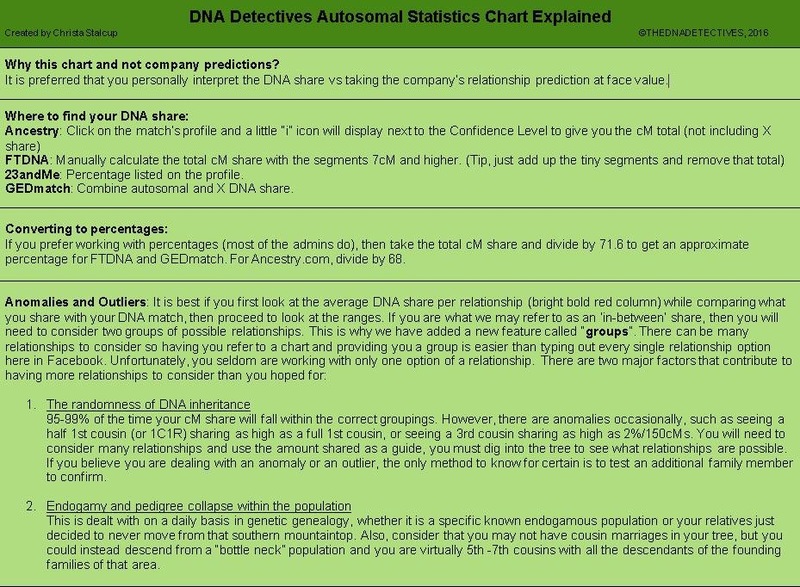 The Online Shared Centimorgan Calculator at DNApainter.com, simply type in the amount of Centimorgans you share with your DNA Match and it will show you the possible relationships. The “DNA Green Chart” does the same thing as the Centimorgan Calculator linked above, but in a format where you could print it out and see the big picture. Ethnicity Estimates White Paper – read more about how the companies create your Ethnicity Estimate. The Leeds Method, named for its creator Dana Leeds, is a way to sort your unknown DNA matches into 4 different categories. Why 4 categories? It helps you sort relatives from each of your 4 grandparents’ sides of the family. Creating family trees can be done with software on your computer, or online at Ancestry.com, or MyHeritage, or Geni, to name a few. Some people prefer to start with trees on paper while checking out theories. This page has some FREE printable forms if you prefer to start with paper and pencil family trees. Especially useful there are the Ancestral Chart, and Family Group Sheet. 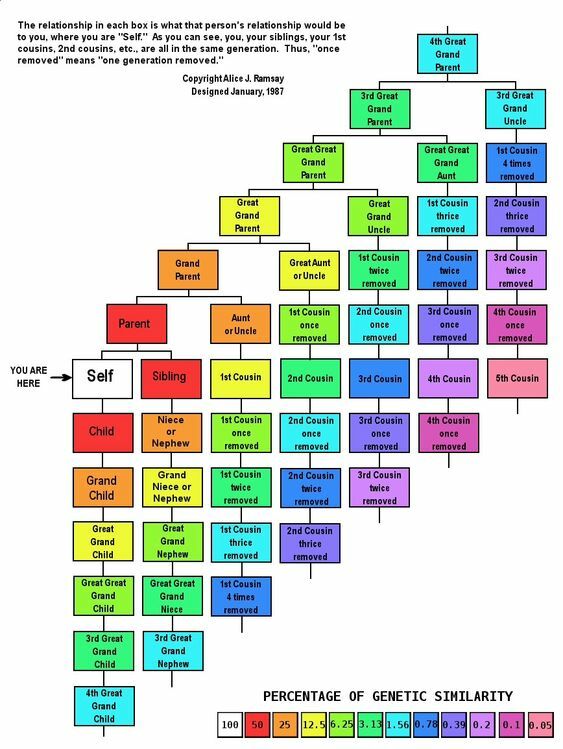 Understanding the types of cousin relationships is necessary to understand how your DNA matches are related to you. There are several online charts which can help you. Building trees for you DNA matches helps you find your common ancestor. You can use genealogy software or online sites mentioned above, or plain old pencil and paper. 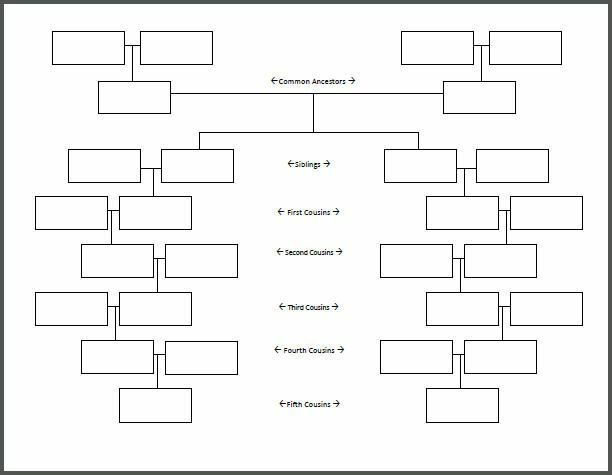 After you use the Leeds method to determine which of your DNA matches are related to each other, you can build trees for your matches to determine common ancestors. Contacting DNA matches: Some people contact unknown DNA matches right away, with mixed success. A better method is to do your research, Leeds Method, and build some trees to figure out what you can, before contacting matches. Here is a podcast that generally talks about contacting DNA matches.